When customer submits a ticket via email or form and have added other people in the CC, by default the system only sends new ticket creation notification to the original creator of the ticket. We have an option for you notify the other recipients of the ticket with the same notification too. Please login to the staff portal as an admin. Click on New Ticket Auto-responder, scroll down to the bottom and edit the template in use. 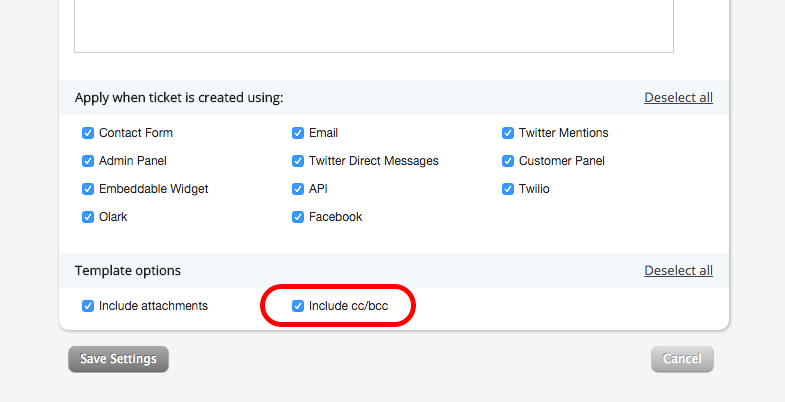 Scroll down to the bottom of the template and enable 'Include cc/bcc' option. Once this is enabled, all the CC's and BCC's will also start receiving the New Ticket Auto-responder like the original client. You can also enable 'Include attachments' option if you would like to send attachments (of client's original message) along with the New Ticket auto-responder.